Michael Pollan (author of "Cooked: A Natural History of Transformation") told the filmmaker, Maggie Beidelman, that her gluten intolerance could all be in her head. She half agreed with him, because the number of Americans buying into the $10.5 billion "gluten-free" industry is disturbing. There is so much more to learn about wheat - and how it has changed in just the last couple of generations - before we completely sign it off. In this film, Ms Beidelman journeys from farm to mill to table on a quest for answers about gluten intolerance and a hunt for the perfect loaf, one she can eat without getting sick. Along the way, she makes some unexpected discoveries about crucial changes to the wheat itself and how it is processed and fermented. Let's just say that bread as you know it, is not what you think. "The Trouble With Bread provides a very engaging approach to a seriously complex and important subject. I believe it will initiate valuable discussions and generate ongoing enquiry for its viewers. The real trouble with bread, as the film reveals, begins when we discover that something so beloved and intrinsic to our being can also be so deeply problematic, both personally and socially." "Beidelman isn't afraid to tackle the difficult questions...It is a great length for showing in a 50-minute high school or college course with time for discussion. It could also be shown to community groups, especially those interested in producing locally grown and milled flour, or those thinking about advocacy on public policies such as food labeling." "Appropriate for students in a range of classes, including survey or introductory-level courses and courses focusing on body, illness, or the culture of food...Relevant and contemporary...Engaging and invites critical thinking." "An engaging film that provides a good introduction to the complex issue of gluten sensitivity and an excellent example of how the industrialization of food can create new problems for human health and nutrition." "A charming, informative exploration of why an increasing number of people experience health problems when they eat bread...A fascinating look at twentieth century changes in agriculture, milling and breadmaking technology. Although convinced by her own experience of the reality of gluten sensitivity, the filmmaker skillfully challenges the often heated anti-gluten rhetoric that's become increasingly common. Instead, Ms. Beidelman makes an important contribution by shedding light on this important issue by weaving together new and archival footage to tell a fascinating story of how bread's role as 'The Staff of Life' may be in trouble." "The Trouble With Bread is true to its title. 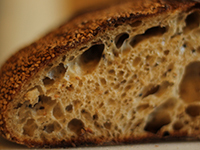 Today's bread is often a highly processed product made of refined wheat that has been bred to be higher in gluten. Most people are familiar with celiac disease, which is an immunological reaction to gluten, but are less likely to be acquainted with gluten sensitivity. This film does an excellent job of describing a condition that may affect as much as 6-7% of the population...The film also explores why the condition is increasing...This film has high production values and provides an insight into non-celiac gluten sensitivity without being overly alarmist." "Fascinating video...A highly professional and engaging program...It is appropriate for health and biology classes and will be especially interesting to students for whom gluten intolerance is a personal or family issue. The DVD also includes an 11-page pdf Teacher's Guide that can be accessed on a computer and printed out if desired. It includes a program synopsis, pre- and post-film discussion questions, a chart of wheat grain structure, discussions of wheat milling, fermentation, and the importance of gluten, and hot links to web resources and related films." "A very thought-provoking look at one of the staples of American life...This short film is very informative and raises many questions for consumers of all ages." "Offers a cautionary warning about the harmful side effects of increased industrialization of food. Highly recommended, especially for public library DVD shelves." "Beautifully shot...informative...High-quality production that is as engaging as it is informative." "Strikes a balance on the issues around gluten, acknowledging the genuine difficulty some people will have along with the costs associated with remedying the situation...This is a solid resource for use in classroom instruction and discussion. Recommended for academic collections with an emphasis on nutrition and health." "Just as gluten draws our attention to wheat, bread can draw our attention to the larger complexities of who creates, profits from, and gets to eat what, in our modern food system."